I could not take off my eyes from the wall where it was drawn. I was engrossed in it details. Honestly, I was awestruck. This was my first encounter with Gond art. Primitive simplicity in the choice of subjects, rich details, vibrant palette, double lined outlines and signature motifs were some of the distinctive features which stood out completely. The painting was unique, admirable and evocative in its own might. For the art lover in me, it was a remarkable chance discovery. I keep a special interest in Indian traditional and local art but surprisingly I was not aware of this art form until I visited Singinawa Jungle Lodge near Kanha National Park in Madhya Pradesh. Gond Art, the form of art that gets its name from one of the largest tribal communities of India is believed to have evolved from one of the tribal customs of painting the mud walls. The story of this art goes back to the times when Gonds used to use natural colors made from flowers, charcoal, cow dung, sap and leaves to decorate the floors and walls of their houses. They would often depict their proximity to nature and jungle through their creatives. Artist Jangarh Singh Shyam was the first one to take this art form to paper and canvas. He actually revived the traditional art, gave it a new life and made the art form recognizable around the world. With the change of time, many artists began to do it on paper with the help of acrylic and watercolors. Each one evolved their own signature style. The deer (barasingha), elephants, trees, tiger, snakes, wild boars, reptiles and different birds are the most common subjects of Gond paintings. The tiger is considered to be one of the most auspicious and favorite subject among the artists. Every artist works with dedication because they all hold on to a traditional belief that looking at a good picture brings good luck. The artists use fine lines, water droplets, dashes, squiggles, dots and other geometric shapes to fill in the subject and these repetitive patterns are the most striking feature of any Gond painting. The artitst Manoj Gandpal made this Gond Art while teaching me the nuances of it. The Gonds or Konds (meaning green mountains) are one the most ancestral tribal group of Madhya Pradesh and have a history that goes back to 1400 years and more. Having lived most of their life close to wildlife, they nurse an affection for the elements of nature which can be easily read in most of the Gond paintings. Furthermore, inspired by their life, the pictures also narrate the practices, folk tales, culture, their religion, festivals and several theories of Gond way of living. 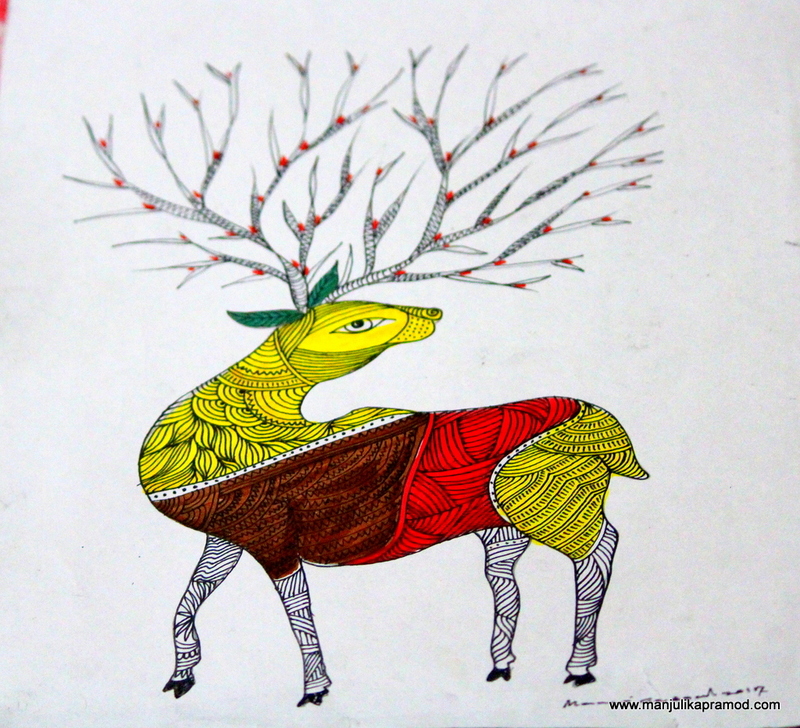 Gond art uses simple subjects chosen from flora, fauna, deities and neighborhood. The art sends out a significant message in the society too because every piece of work captures a relationship and depicts interdependence of human, animals, nature or wildlife. My interaction with Manoj Gandpal was enriching for me. I have a knack for art and I was keen to take a quick lesson from him. He not only painted a sample for me but also made me do one. For this quick lesson, we used colored pens and a fine black pen for the outline and the patterns. It all began by choosing a subject inspired by the wildlife theme. Then we drew a barasingha whose horns took the shape of the branches of a tree. Once the proper outline of the subject was done, he guided me to fill the base. And in the third step we decided on a pattern (fish scales) which I repeatedly filled in the subject. This is where I realized that a lot of focus, practice and patience was needed. I Travel for Art. Do you? If I have been successful in piquing your interest for Gond art, you must visit Patangarh village in Madhaya Pradesh. A lot of art forms in India are either dying or are not very popular. The artists are losing interest due to lack of money or support. The numbers are dwindling. Thus, we should all make an effort to explore a local art and promote it in whatever way we can. After coming back home from Singinawa Jungle Lodge, I made some Gond art in my art book too. 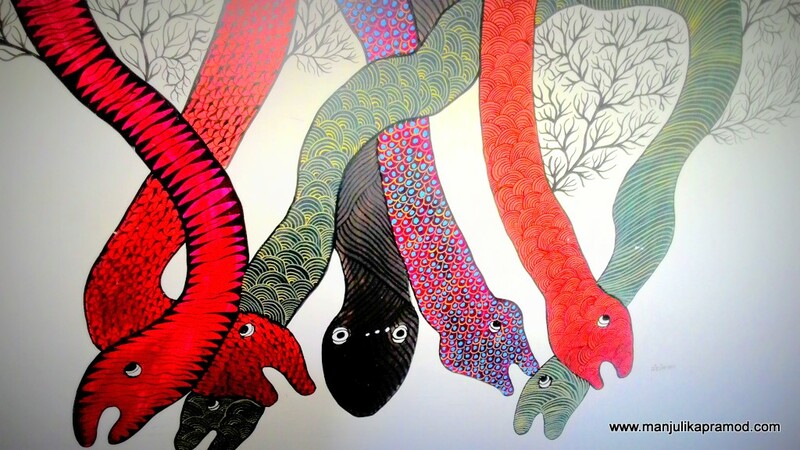 Must Art Gallery– The world’s first art gallery dedicated to Gond art. Gond paintings share some similarities with aboriginal art from Australia because of the common use of dots to make patterns. An edited version of this post was published in Sakal Times on 11th February! 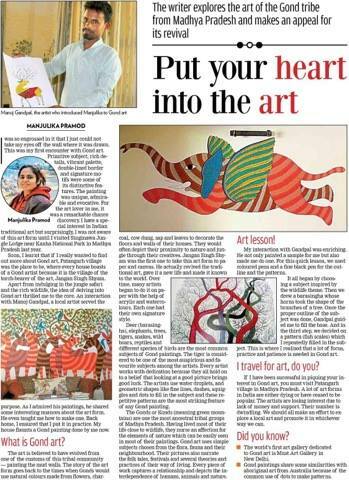 Gond art looks so interesting and though provoking! Love the designs and colours used. I would love to hear about the stories behind some of them, like the one with the deer. This art style is unique and new to me. I really love the simplistic nature of the subjects. I also love the idea of using natural colorings from the land to make beautiful art, although I might stop at using the dung. It makes me want to visit the area! How interesting and what a history to learn that it came from Indian tribes. I love the use of vibrant colors in Gond art…plus nice to know that they also tend to use more natural ingredients to create the paint. 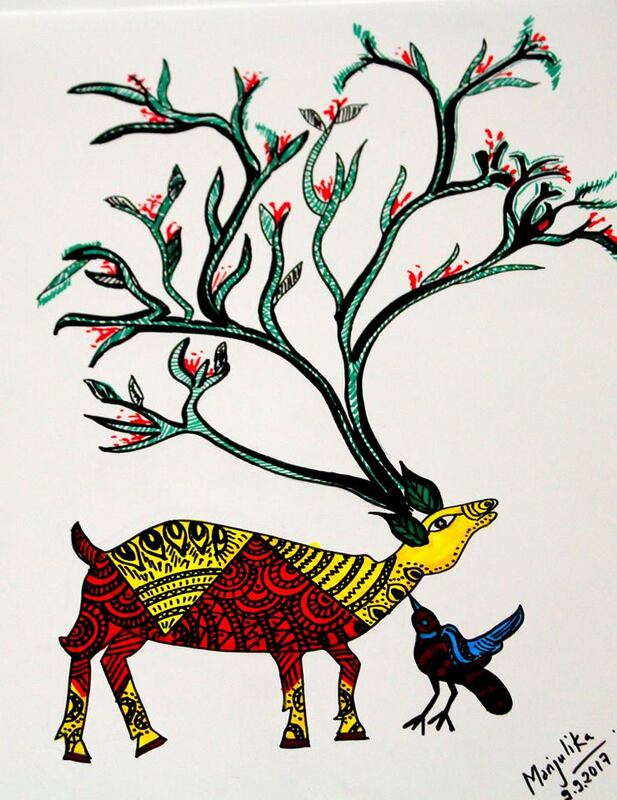 I like how you have taken the influence of Gond art and created your own version with the deer. Nice one! What beautiful and vibrant art! I completely see why you love it. The natural aspects still feel so otherworldly and like something from a fantasy or sci-fi book. Love it! Thanks so much for sharing. What a fascinating form of art! The colours and details are fascinating. I would pay more attention next time I travel to India – maybe I will come across it somewhere! So beautiful and so different. It reminds me of the prehistoric painting in the cave of northern Spain. Both of the styles evoke the beauty of natural elements making a step further the simple imitation. They are able to capture not the shape, but the essence of the natural world. When I watch this painting my mind is filled with colors, the beauty and the elegance of plants and animals and sense of peace and beauty overflows my mind. Thanks for sharing, I am Euorpean, and I was totally unaware of such noble tradition as Gond Art is. 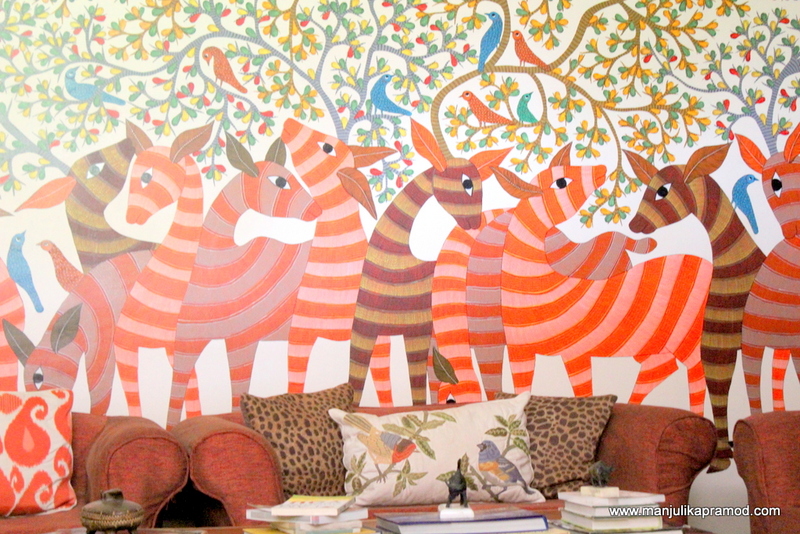 We weren’t aware of the Gond art too until we read your post. Really India has so many such art forms and rich painting traditions in the remote parts of the country which are not known to most of the people. Love the use of unique designs and bright colors in the art. Hands-on must have been an amazing experience. I am not much of an art enthusiast unfortunately and I haven’t heard f Gond Art before but this post was very insightful and the art is rich! It is interesting to know (and see) that Gond art revolves a lot around animals and the deer in the first painting (looks like a wall painting) look really beautiful! Manjulika Pramod,thank for the post.Really thank you! Much obliged.